Urban Horse Promotes a Easy Up Cable and Buckle Kit for the Easyboot / Epic, Grip and Bare Horse and Pony Hoof Boots by Easycare. 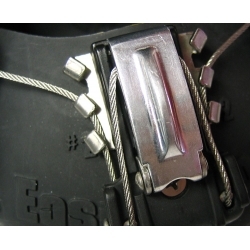 Easy Up Cable and Buckle Kit is a new development in hoof boot technology. The easy up buckle can be used on easyboots, epics, grips and even bare hoof boots to replace the existing fixing. The buckle is more secure than the original buckle, and supplies far greater adjustment potential which is ideal if your horses foot shape requires a tighter fit than the easyboot bare bungee can supply. If a tight fit is required, purchase the easy up buckle kit one size smaller than the hoof boot size to obtain a slightly shorter cables designed to replace a worn or broken cable or buckle on an easyboot or easyboot epic hoof boot. A rivet gun is required in some instances, newer models can simply be changed using a screwdriver. SIZING OF THE CABLE / BUCKLE KIT IS THE SAME AS PER THE SIZE OF THE HOOF BOOTS THEY ARE REQUIRED TO FIT UNLESS A TIGHTER FIT IS REQUIRED GO DOWN A SIZE!